English test cricketer who was banned from playing in South Africa, awarded the Companion of the Order of the British Empire by the Queen of England. Basil D’Oliveira (Dolly) was born on 4 October 1931, in Signal Hill, Cape Town of Indian-Portuguese heritage. According to South Africa’s racial laws, he was classifiedas a ‘Cape Coloured’. At 17, he played cricket for his father’s club, St Augustine’s on an open field which was shared by twenty five other teams. He would walk about 10 miles (about 16km) on the morning of a match to help prepare the wicket, watering and rolling it so it would bake hard on the surface and had to nail the playing mat down to the pitch, placing rocks and boulders on the edge to stop animals as well as people from walking straight across. D’Oliveira did not receive any formal coaching; he practiced playing in the streets of Signal Hill, where his family lived. Some of his friends were arrested and detained when the police found them playing in the street. His father had a great influence in shaping his cricketing career. In 1958, he captained the touring South African ‘non-white’ team that played against the Kenyan-Asian team. D’Oliveira also played soccer, for instance during the days of segregated sport, he was selected as a right wing for the South African Coloured soccer team, in 1958, but cricket remained his favourite sport. As the 1960s approached, D’Oliveira realised that he had no future as a Black cricketer in South Africa. D’Oliveira wanted to play in England but couldn’t convince English clubs to accept him. He wrote to a famous British commentator, John Arlott who was considered the doyen of cricket commentators at the British Broadcasting Corporation (BBC). In February 1960 a reply came from Arlott that changed his life. After two years of perseverance on D’Oliveira’s behalf, Arlott obtained a contract, for D’Oliveira, with Middleton in the Central Lancashire League for one season for a sum of £450.00. With his wife, Naomi’s, encouragement alongside three friends, Damoo ‘Benny’ Bansda, a sports writer who had sent a list of his performances to World Sports magazine in England, his brother in law, Frank Brache and Ishmail Adams formed a committee to raise funds for his trip. One of those who contributed handsomely was Gerald Innes, a White, former first class cricketer who defied the apartheid laws and put on a game that raised £150 alone. Innes died of cancer at the age of 50 in 1982. Innes and his White team mates walked around the ground with buckets collecting coins. Leaving his wife and child behind in South Africa, D’Oliveira set off for London. He arrived there on 1 April 1960. After his arrival in England, Tom Reddick, a former Nottinghamshire player who played in Cape Town and knew the League system well, spent an entire month devoted to coaching him, in his backyard, about the English game. This was the first time he had ever received formal coaching of any kind. By the end of his first season in England, he ended with a higher batting average than the legendary Gary sobers who was considered the best cricketer in the world at the time. At the age of 34, D’Oliveira made his debut for England against the West Indies in 1966. In 1967, he was named as one ‘five cricketers of the year’ by the authoritative cricket publication, Wisden. Two years later, he was approached to play first class cricket for Worcestershire. D’Oliveira was dropped from the English team to tour South Africa under pressure from then South Africa Prime Minister, John Vorster, although the selectors claimed that they did not know of any political interference. 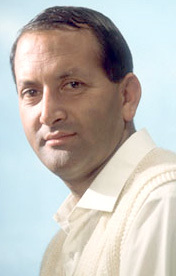 In 1968, D’Oliveira was included in the English cricket team to tour South Africa. Then Prime Minister, John Vorster, banned D’Oliveira from accompanying the team. D’Oliveira retired from international cricket in 1972 but continued playing Worcestershire until he was 49. Upon retirement, he became the team coach and steered the team to two Championship victories in the 1990s. In 2000 he was nominated as one of the 10 South African cricketers of the century. In 2004, the ‘Basil D’Oliveira Trophy’ was established for the Test series between England and South Africa to honour him whenever England toured South Africa. The inaugural Basil D'Oliveira Trophy was presented at Centurion in January of that year to the winners of the series, South Africa. That same year, Graeme Hick officially opened Worcestershire's (England) Basil D'Oliveira Stand on 4 May 2004 as a fitting tribute to one of the game's great legends. In 2005, the Queen of England conferred D’Oliveira with the Companion of the British Empire (CBE) for his contribution to English cricket. By the time he retired in 1972, D’Oliveira had played in 44 tests for England. Basil Lewis D’Oliveira (Dolly) passed away on 19 November 2011. He is survived by his wife, Naomi and sons Damian and Shaun. • D'Oliveira B, Basil D’Oliveira [online] Available at www.basildoliveira.com. Accessed on 22 November 2011.